Whether you are doing it yourself or using a PureBond Fabricator Network professional, it pays to plan carefully and stay organized. 1. Get inspiration by browsing your local Home Depot store, visiting a kitchen cabinet showroom or surfing the web. Be sure to check out things like cabinets, countertops, cabinet hardware, sinks, faucets, as well as appliances and flooring. 2. Consider green options. Choose appliances with the Energy Star label to ensure lower energy use. Look for faucets and fixtures that reduce water consumption. And shop for renewable, formaldehyde free materials such as PureBond. 3. Measuring your space is an essential part of the planning process. Measuring accurately helps ensure that everything will fit and function properly. Be sure to account for things like the location of doors and windows, and other factors like the location of heating elements, pipes, switches, etc. 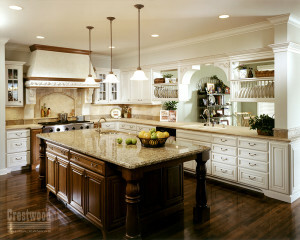 The kitchen planner specialists at Home Depot or your local PFN can do all of this for you. 4. Complete your room space with things like moldings, wall treatments and lighting. These are the little things that can add so much character to a room, so it’s best to think of them from the very beginning. 5. When you’re ready to select your items and place your order, you’ll find that the specialists at your local Home Depot store or your local PFN will be eager to help you with final decisions and pulling everything together.